Western Canada's Leading Large Format Digital Print Provider! 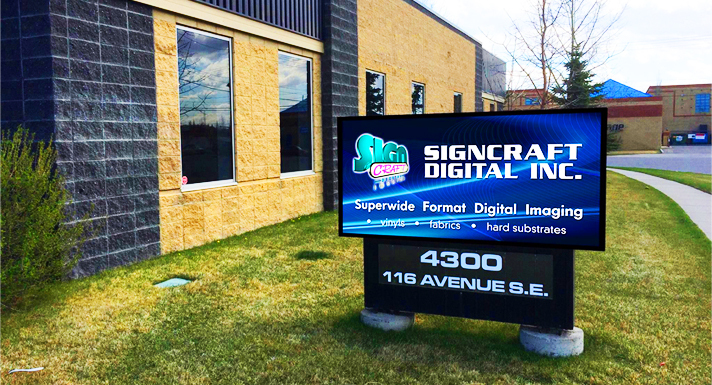 SignCraft Digital Inc. of Calgary, Alberta is one of Canada’s premiere production facilities. Our 22,000 square foot shop houses the most up to date equipment available anywhere, and that technology is offered to you at very cost effective prices without compromising quality. From your first call you will notice that you are dealing with graphics professionals who know their business. Our quotations are back to you directly with all materials specified and no hidden costs. The product is delivered within the time promised and we will do a follow up call to see if you, the client are another satisfied customer. Whether you need new images for that trade show booth, or graphics on the floor of a new retail store, SignCraft Digital Inc. can assist you in producing exactly what you require. Price, Quality and service are our number one considerations. SignCraft Digital Inc. is a 3M Scotchprint™ Graphics Authorized Manufacturer, and offers wholesale pricing to sign companies and advertising/design agencies. Should you have any questions please do not hesitate to contact us directly.